They're hoping for one last clue, through modern science and DNA, for one last answer. MCCAYSVILLE, GEORGIA — It's like every American small town. It just had a secret. Set beneath a sweeping Blue Ridge mountain landscape, McCaysville, Georgia is the setting for a tawdry old tale, swept aside for three decades. And then the babies, all grown, started talking. And the world took notice of the secret adoptions. Today, those men and women are talking again. They're hoping for one last clue, through modern science and DNA, for one last answer. The want to know who they are. Where they came from. And, yes, based on their own age, they know time is running out for them to meet their birth parents or siblings. This DNA testing, the same type that helped identify the "Golden State killer" and other cold-cases, relies on genealogical DNA, a test that looks at a person's genome and helps determine someone's ancestors and genealogical connections. Data bases are often mined from private companies such as ancestry.com. 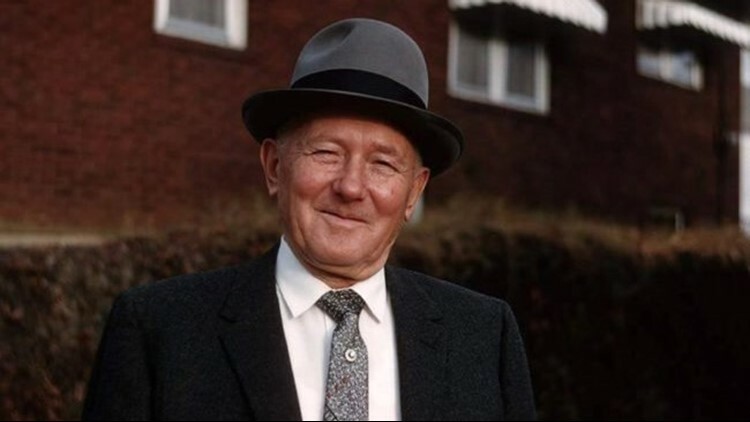 The McCaysville group is connected to Dr. Thomas Hicks, the town doctor and a popular, church-going man, revered by locals for his generosity. "I think he was a good man. as I say, not perfect, but a good man,” Abernathy said. But it was Dr. Hicks who’s been cast as the lead in this story. He performed abortions in the 1950s, long before Roe v. Wade became law. But these abortions did not entirely mesh with his beliefs. So, in some 200 or so cases, Hicks convinced young women to carry their babies full-term, and allow him to handle their adoptions. Eager families from the Midwest came to this town on the Tennessee-Georgia border. Paying $200 to $1,000, the families left McCaysvillle with a bundle of joy and a bonafide birth certificate. The adoptions ended with Hicks’ legal troubles in 1964 – not for the adoptions, but for the abortions. And in 1972, Hicks died at age 83. His work remained buried as well. Until Mother’s Day 1997, when his adoptions were exposed. The news captivated many outside McCaysville. In the small town, the so-called Hicks babies were shunned. "It was a brick wall. Nobody wanted us to help us at all,” said Melinda Dawson, one of the first go public. As an infant, Dawson was sold for $1,000 in 1963 and raised in Akron. She still remembers the day her adoptive mother, Judith, broke the news. She was about 7 years old. "My mom took me for a car ride and just stopped and proceeded to tell me that even though she loved me, she was not my real mom, that I had come from a clinic in Georgia," she said. That memory stuck with Dawson. And when she was an adult, she made her journey to that clinic. And to the local courthouse, where she learned that her birth certificate was held in a special file. But Hicks’ record-keeping left few clues. 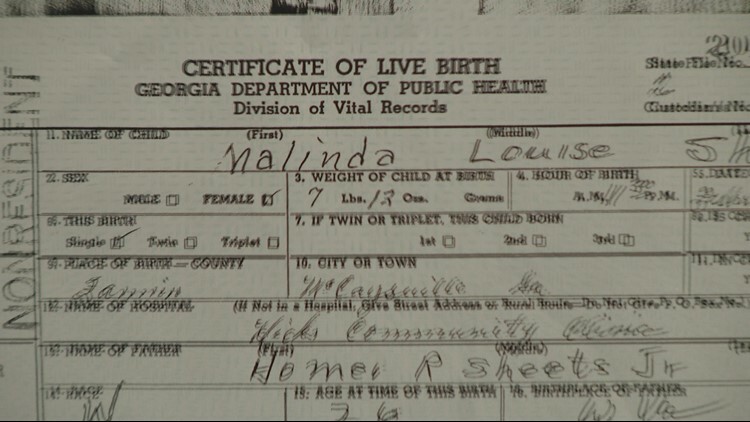 Her birth parents were never named on the one-page document, only the names of her adoptive parents. Dawson, 55, is a bit of a detective. When her adoptive mother, Judith Johnson, was murdered in Barberton in 1998, and Dawson’s husband at the time, Clarence Elkins, was arrested, she spent about seven years investigating the case and eventually winning Elkins’ release from prison. Now, she’s on another mission, struggling to find her birth parents. While many Hicks babies have been reunited with their birth parents or siblings over the years, Dawson waits, hoping this new ancestry DNA testing will help. "And this one kills me because I can't solve it right now," she said from her home in southern Ohio. Diane Conrad, of Akron, is in the same fight. Delivered by Hicks in 1957--- she's grasping to one last glimmer seeking her birth family, to finally know who she looks like, or what traits they share. "All my life I felt like I was just dropped here, that I have all these people around me, they're my family, but they're not my blood-related family,” Conrad said. "That's hard---I feel cheated that I don't know." Some Hicks babies have found their birth families, many through internet ancestry sites. And as a group, they remain close, on Facebook and reunions----sharing their genealogical work and DNA dreams. “Never has been black market babies,” she said. She is close with the group, however, and is considered part of the family. She believes Dr. Hicks chose life for these babies and did not profit from the adoptions. The birth mothers often had needs, the babies had needs. There were bills to pay. Most were placed in good homes and most went on to have successful lives, she said. “He was a good man, a good-hearted man. He’d do anything for anybody---sometimes he’d pay a price for it,” she said. Sompayrac is cheering on the Hicks babies, hoping the new DNA testing that the group is seeking pays off. “Some may find them alive, some may not be alive, but at least they’ll know where they came from,” she said. The DNA testing is ongoing and Dawson said she believes an answer is coming soon. She credits her fellow adoptees for bringing strength. “There's no other way to describe it. We're all in the same boat and so we have become that de facto family, that I think Dr. Hicks never thought we would be," Dawson said.